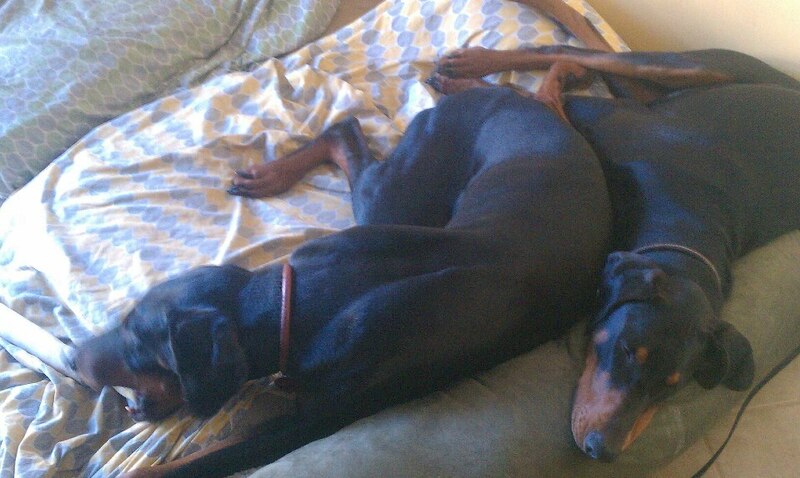 So where to put two monstrous dogs and two truck tire sized dog beds? ANY PLACE YOU HAVE A TILE FLOOR! 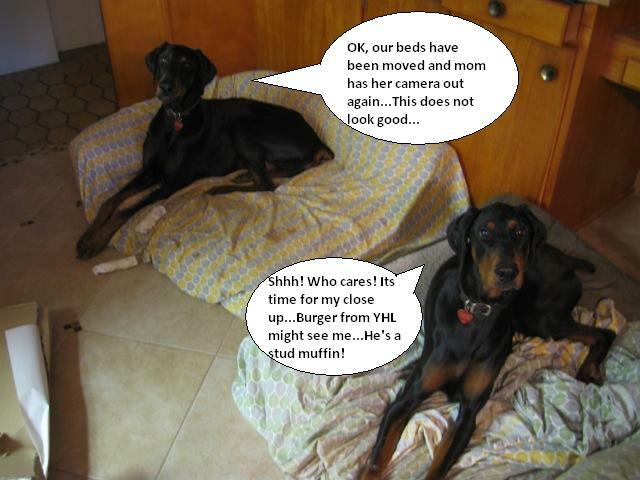 This is why we created our previous two Murphy dog beds and strategically placed them adjacent to our first home’s kitchen nook and back slider. We’ve always loved little houses, easy to clean, less maintenance, however the obvious problem is less space. We have a “no dogs in bedrooms” policy because of shedding, and snoring. Also our two bruisers are magnets for anything dusty, dirty or muddy. Another big reason, since we live near the river, wildlife ventures into our neighborhood quite often. Which means no sleeping outdoors or in the detached garage, where they can bark all night. Also when your husband has had to defend the pups from toddler sized raccoons, its best to keep the dogs indoors for safety sake. In our new home we’ve had to be uber creative, since we lack extra seating in our tiled kitchen/dining area. We love to entertain and we wanted to create a seating bench/built in. Unfortunately the hubby had a good point, the dogs are getting older and to create a custom dog bed/seating bench may not be logical or economical. 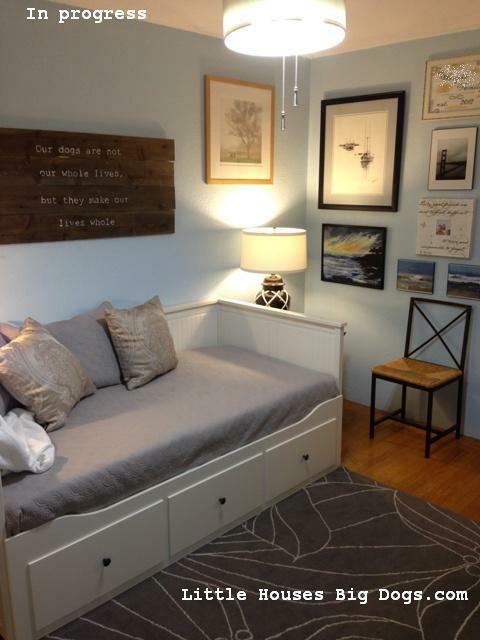 Hence I found inspiration once more with Ikea furniture, and created our Seating Bench/Trundle Dog bed. 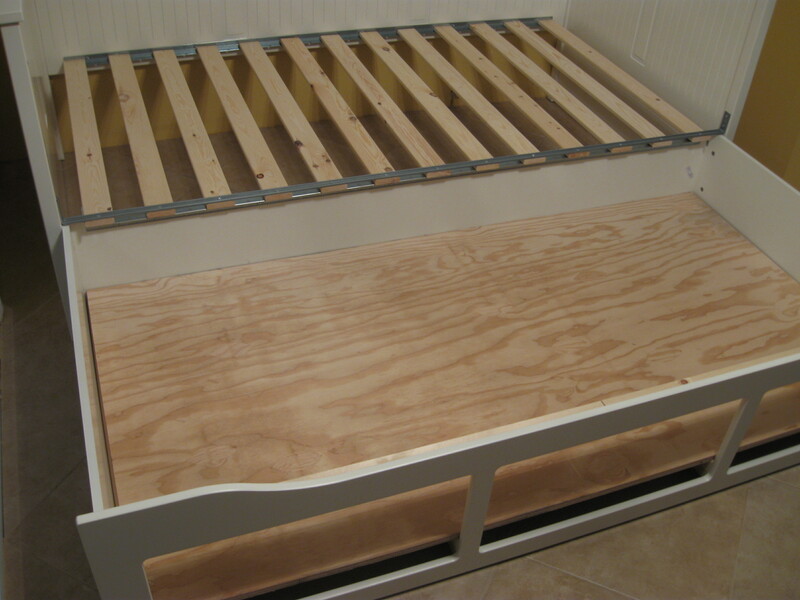 After we bought the first day bed we were able to figure out how to hack the trundle pretty easily. 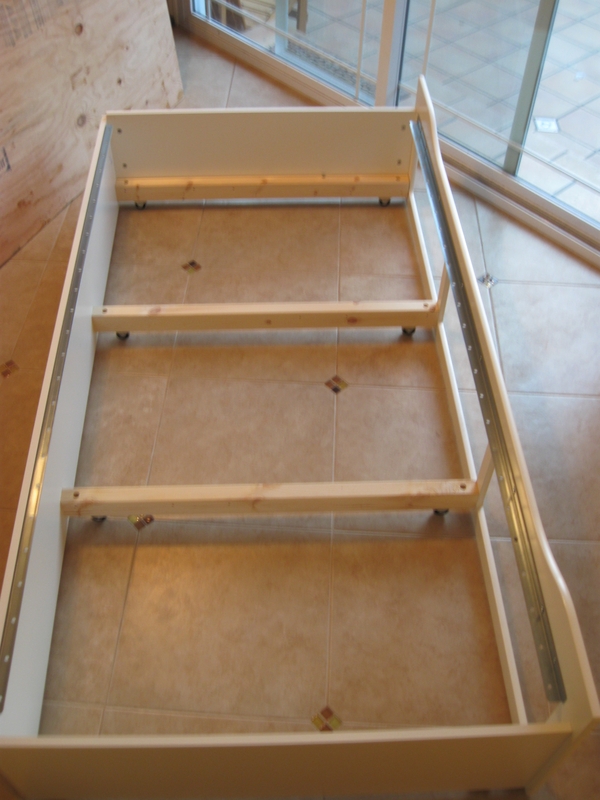 First follow the instructions to create the bottom trundle and drawer component, minus the slats, but still attach the metal braces as the directions describe. 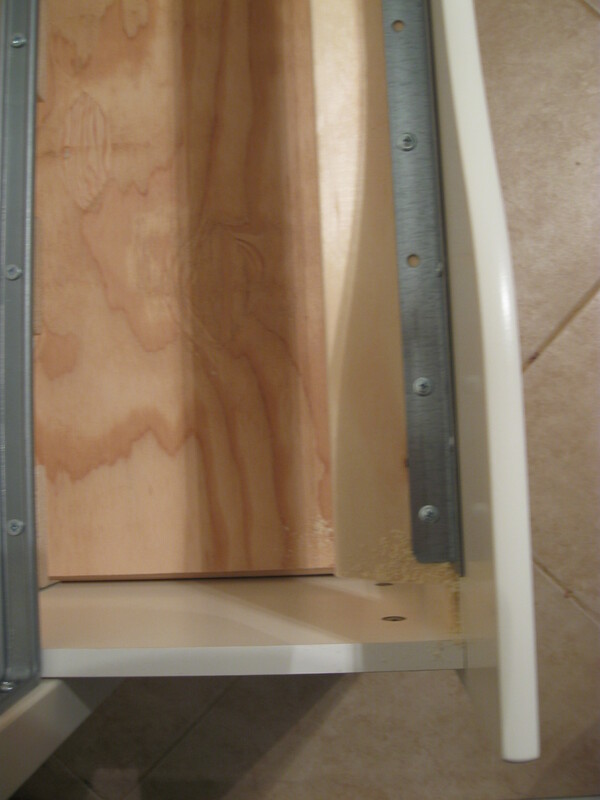 This is critical, now measure the inside/interior edges of the bottom drawer component to ensure the plywood you purchase (separately from a hardware store) will fit perfectly inside and atop the wheel braces. It should look like the following picture. We also recommend buying a thicker plywood if you have abnormally large dogs like ours. 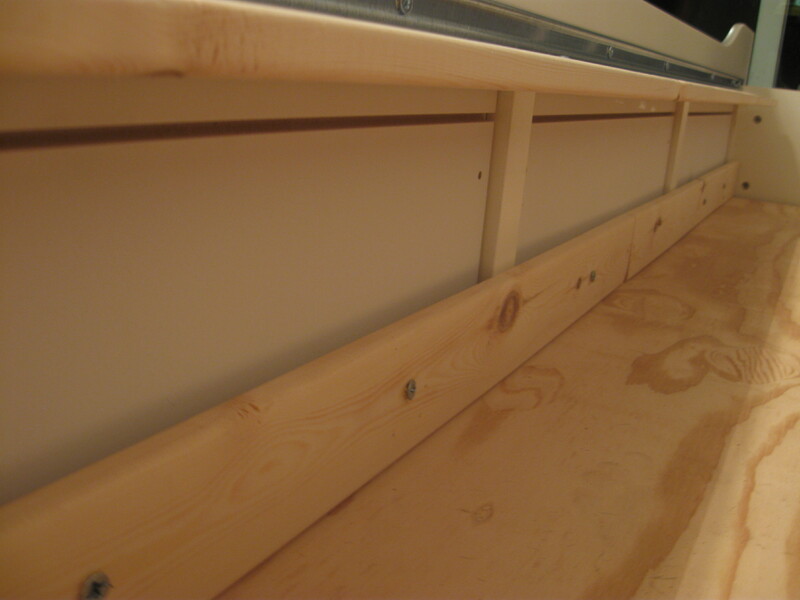 Using the extra slats, we cut two of them to fit the entire length of the metal braces. 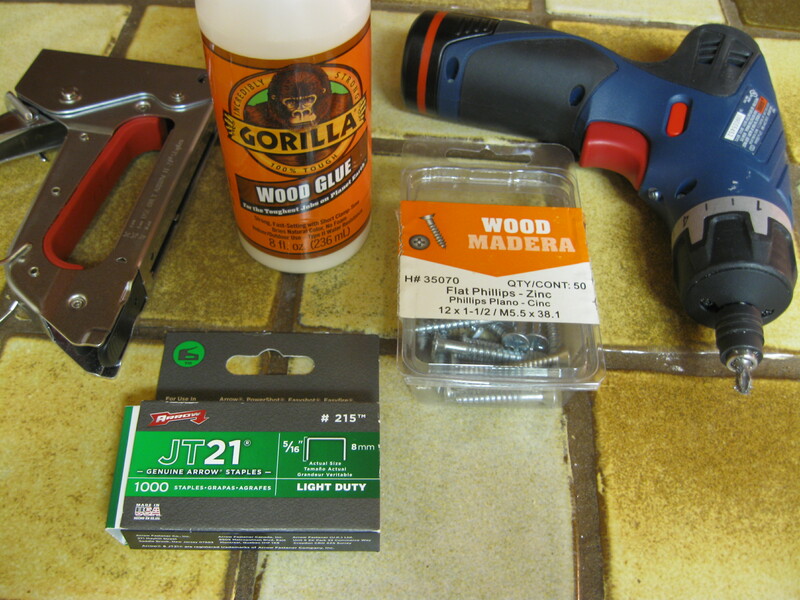 (with a small hand saw) Use small wood screws (1/2″ phil mod, zinc lath self drills, from Home Depot) and a cordless drill to attach them through the metal brace holes. The reason we did this was to protect our rambunctious dogs from being sliced by the metal braces. The slats are made of soft wood and helped create a rounded edge. 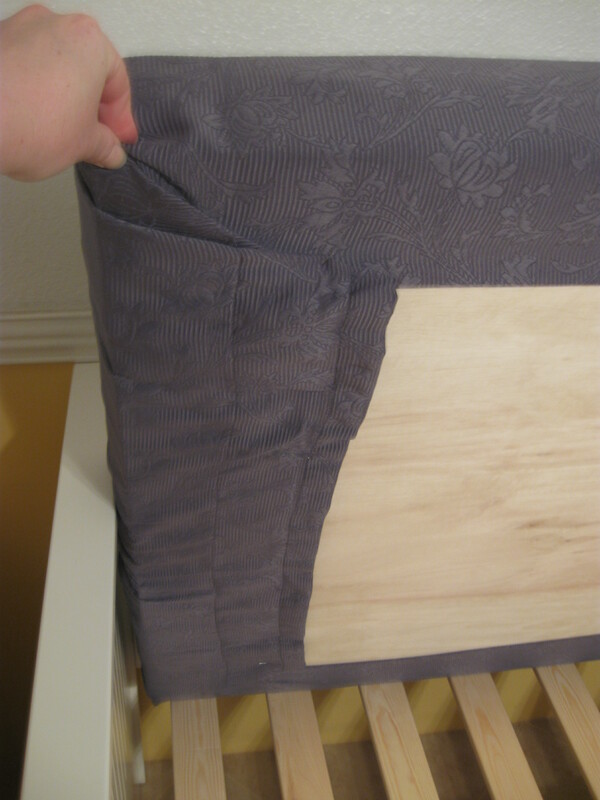 As you can see we cut two additional slats to fit the bed’s length and were careful to not drill through the front of the drawers. 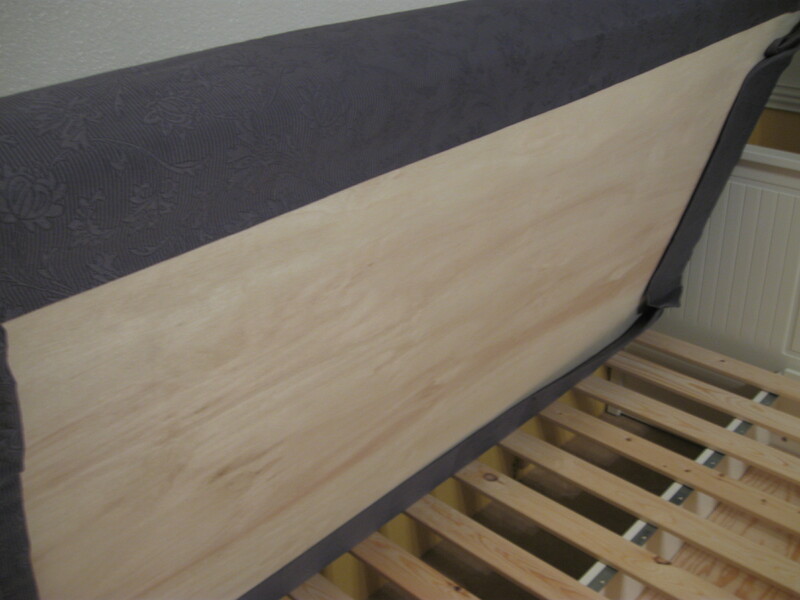 We made sure the edge of the drawer’s back was coated in glue before drilling them to the slats. Next we upholstered the bench seat. 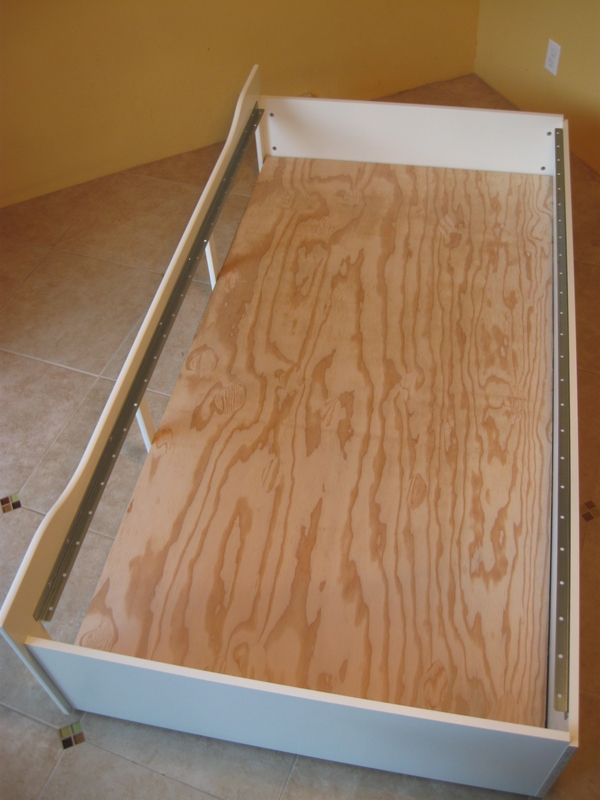 Using very light weight and sanded sheet wood, we had cut to the dimensions of the daybed. We set an old ikea curtain on the floor, the sultan florvog mattress on top of it, then the plywood. We folded the curtain over and stapled it to the plywood. 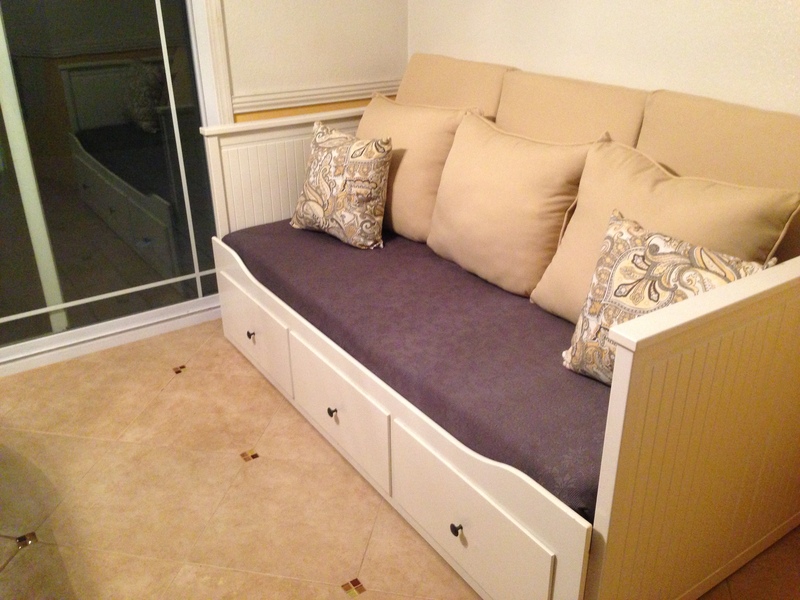 Finally Seating bench/Trundle dog bed complete! 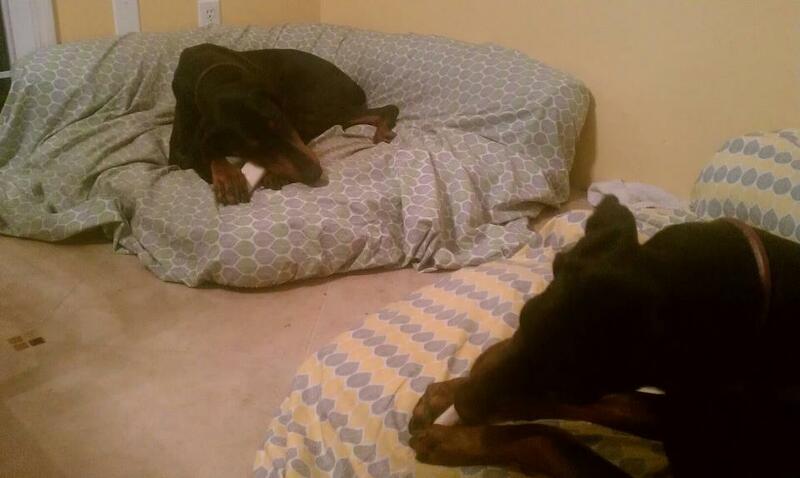 We placed a second sultan florvog mattress for the actual dog bed. These mattresses are fabulous, the covers come off easily and are washable. 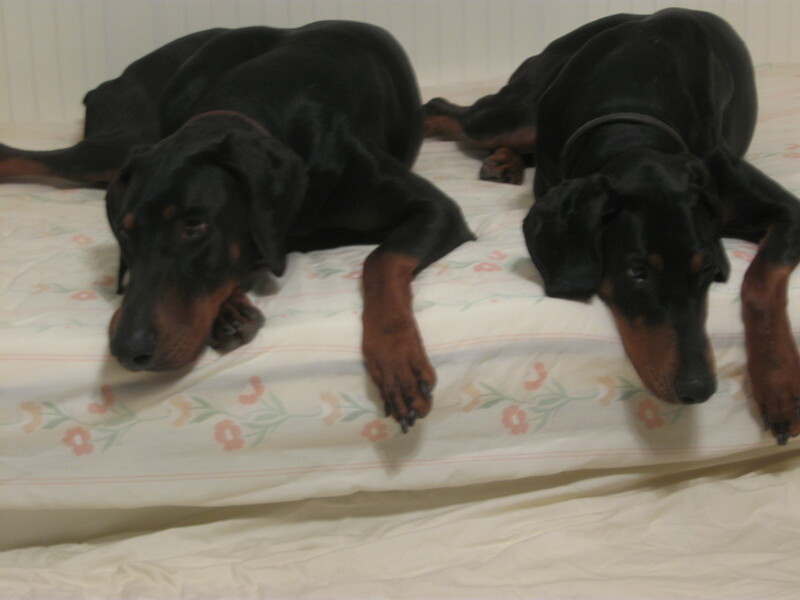 Also we can conveniently protect them with standard fitted twin sheets and waterproof covers should we ever need to. We plan to upgrade the bench seating with a different color scheme in the coming weeks. 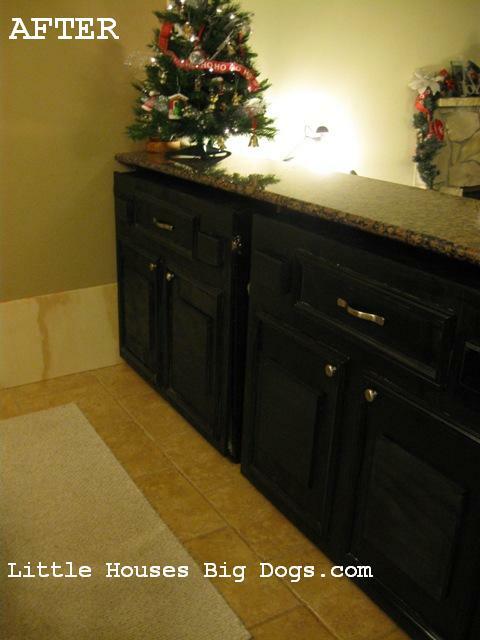 However we’re waiting until we figure out the kitchen’s future colors. PS. 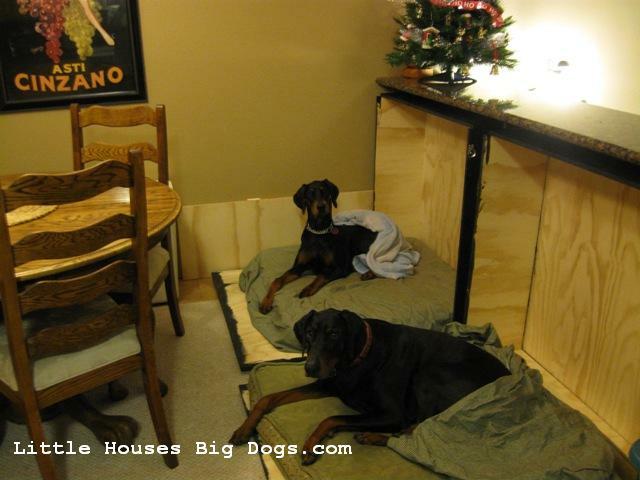 We made sure the dogs actually “liked” their new bed before we started hacking. 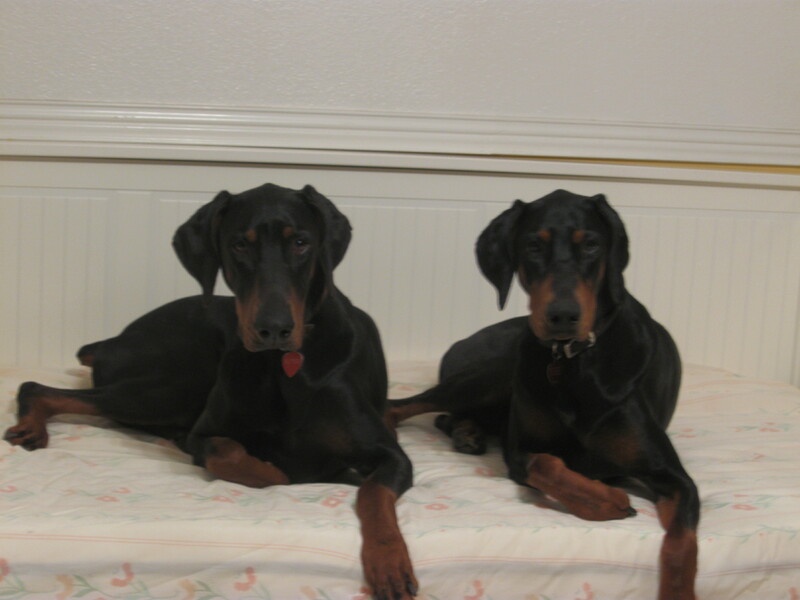 We might recommend you let your dogs give it a test drive first before the step of gluing, cutting and drilling slats. 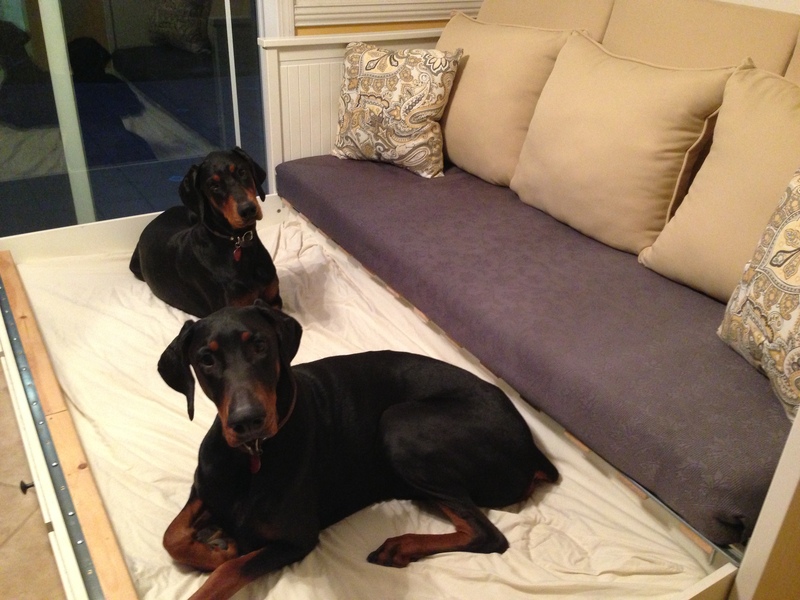 As well, ours like to sneak onto the upholstered bench so we protect it with a fitted sheet and plastic cover when not in use. 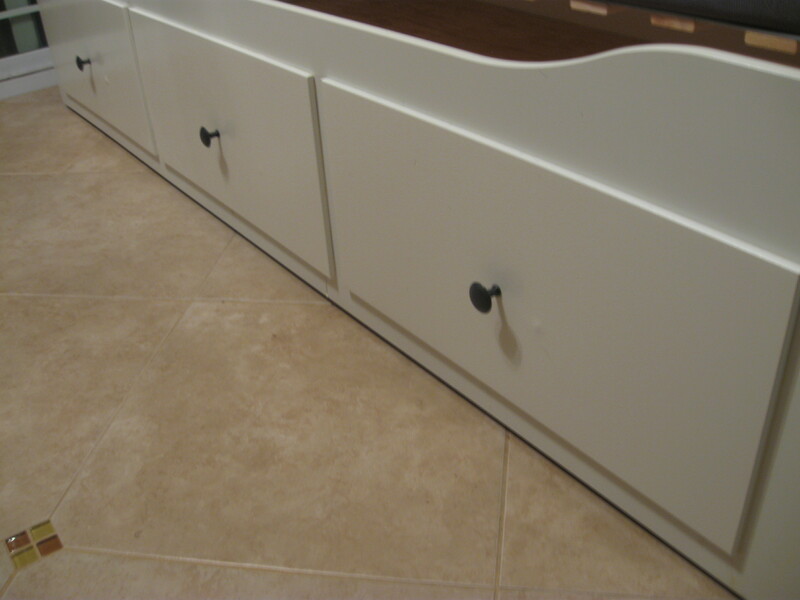 This entry was posted in Projects and tagged Daybed, Dog, dog bed, dog bed bench seating, Hemnes, Ikea, kitchen built in dog bed, Trundle bed, Trundle dog bed by Tandra. Bookmark the permalink.